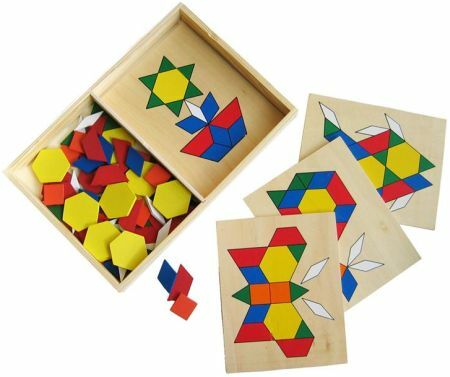 Build A Picture Puzzle Shape Set is a wonderful, wooden, educational, puzzle toy. This toy can be used in a number of ways and grows with your childs abilities. Images can be built up, using the many coloured shapes, by directly placing them over the supplied pictures or by using the pictures as a guide. The set is also great for little ones to create many interesting patterns by arranging the pieces in shape and colour combinations. The set comes with over 50 coloured wooden shapes and 4 plywood picture boards with images printed on both sides. Size: Box is 21 x 32 x 4cm. We like this because: "like all good educational toys this has multiple uses and grows with your childs abilities"